Sometimes an enigma makes an artist famous. There is perhaps no greater example of this today than The Weeknd (né Abel Tesfaye), the 22-year-old Toronto singer who exploded onto the music scene last spring with the release of House of Balloons, the first of three critically acclaimed mixtapes. First promoted by the rapper Drake, he has since attracted the interest of industry heavyweights like P. Diddy and Rick Ross. Tesfaye has become an Internet sensation despite, or maybe because of, his inscrutable profile—he has never given an interview or appeared on television. Last Thursday, he performed to a sold-out crowd at Lincoln Hall in Chicago as part of his first tour in the United States. The Weeknd’s music is as hard to understand as his persona. It has been categorized invariably as post-R&B and contemporary dubstep, among other more obscure genres. His voice has remnants of Michael Jackson’s chilly falsetto and D’Angelo’s soul, and he combines these elements into his own sound. His songs about lust, drugs, and obsession are at once dark, fierce, and opaque: an ethereal sound made eerily beautiful by Tesfaye’s penetrating voice. His lyrics straddle the line between aggression and intimacy. Illangelo and Doc McKinney, two well-established producers, add the multi-layered richness that’s present everywhere in the work. The tracks also rely on long, dreamy extensions (“Loft Music”), multiple parts (“The Birds” and “The Party & the After Party”), and dramatic lead-ins that peak at Tesfaye’s piercing entrances (“High for This”). After revealing himself to the public, The Weeknd’s new dilemma is how to translate his sound into a live setting. With the music’s gravity, it is almost impossible to recreate the emotional experience of the album for a live audience. Lincoln Hall’s setting gave him the best chance to do this: The cozy, 500-person venue’s exposed brick and near-perfect acoustics allowed Tesfaye’s voice to both soar and feel intimate. Eschewing an opener, Tesfaye snuck out through the backstage curtain 30 minutes late and jumped right into the steamy “High for This.” Backed by a three-piece band consisting of a bassist, drummer, and guitarist, he proceeded to breeze right through his cover of Jackson’s “Dirty Diana,” then the first part of “The Birds” and a gorgeous, stripped-down rendition of “Rolling Stone.” Two popular Drake collaborations, “Crew Love” and “The Zone,” followed. Afterwards, Tesfaye finally stopped and acknowledged the crowd with some awkward small talk: “I bet it’s better being inside than outside.” It was raining at the time. Yet all too often, Tesfaye substituted a quicker, more active live interpretation of his songs for the dreamier feel of his studio compilations. Whether or not this worked is debatable. Although he maintained the general feel of the recordings, his live performances tended to veer off into gyrating, bruising renditions; Tesfaye often moved back and forth across the stage before settling in behind the central microphone, a position he should have stayed in more often. Some songs, like “Trust Issues” and “Outside,” were far from memorable. What did manage to cut through these weaknesses was his voice—an instrument so unique and powerful that whatever his band did never really mattered in the end. 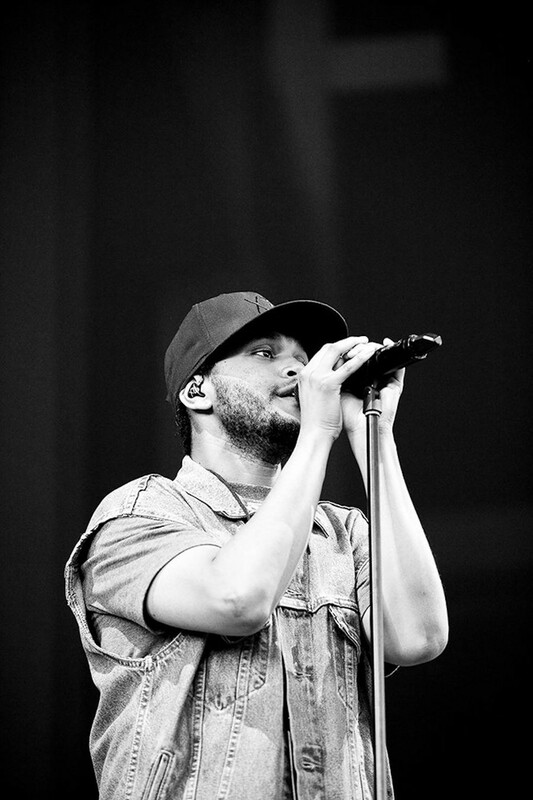 His execution of House of Balloons, the best of his mixtapes, was the concert’s real strength. His performances of “The Knowing” and “The Morning” maintained the blend of delicacy and lavishness that marks the originals. For the sake of time and ease, Tesfaye often cut down the songs and added imposing instrumental parts for his band; with “Loft Music,” he replaced the spacey vibe of the recording with a quick, rhythmical three-minute rock jam. Unsure of how to interact with a fanatical crowd that knew every word to every song he played, he opted for yelling, an off-key, “Let me hear you scream!” several times. After rounding out the set with “House of Balloons/Glass Table Girls,” he came back out to perform the highlight of the night: an acoustic rendition of one of his best anthems, “Wicked Games.” The transfixed crowd sang along to every word. Tesfaye was so comfortable with his own voice at this point that he signaled for his guitar player to back out so he could end the show a capella. After a mere 65 minutes of performance, Tesfaye blew a kiss to the crowd and disappeared behind the curtain once again, an apt metaphor for the ever elusive artist.